This June the Nevada Bureau of Land Management plans to auction oil and gas leasing rights on 934,244 acres of public lands in the Ruby Mountains area. Photo by Tom Hilton. 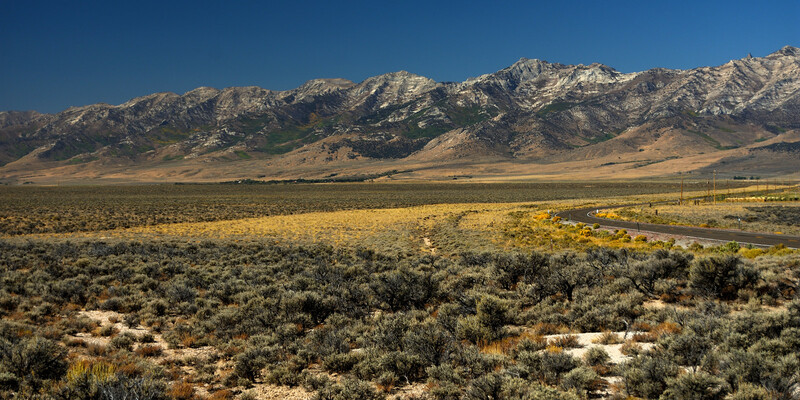 The Ruby Mountains are a prime summertime destination for anglers and hikers, but for the Te-Moak Tribe of the Western Shoshone, who have called the area home for tens of thousands of years, these are the Duka-Doyamountains. Here are pronghorn and bighorn sheep, mule deer and greater sage-grouse. The rivers run with mountain whitefish and native rainbow trout, while endangered Lahontan cutthroat trout swim in the lakes. Here the Te-Moak have gathered nuts and branches and tracked the pathways of wildlife, in tune with the changing seasons. Over millennia, the Te-Moak learned what plants grow where and when, and which animals come to drink in certain springs. Another 52,533 acres in the nearby Humboldt-Toiyabe National Forest were expected to be similarly auctioned, but the US Forest Service denied that lease request on March 14 following months of public outcry and data that showed the land had little drilling value. The 1863 Treaty of Peace and Friendship at Ruby Valley acknowledged as Shoshone lands a wide swath from the Shoshone River Valley in the north, to the Smith Creek Mountains in the west, to the Colorado Desert in the south, to the Great Salt Lake Valley in the east. Chairman Holley denies that, stating that aside from a February 4 letter informing the tribe of the June auction, the Te-Moak have not been contacted in other manners. According to Holley, authentic consultation has not happened. When I contact all three BLM relevant districts (Ely, Battle Mountain, and Elko), the claim to have visited tribal members appears to be more aspirational than accurate. Greg Deimel, public affairs specialist for the Elko district, says their district’s tribal liaison Native American coordinator would have met with tribal councils in January were it not for the government shutdown. In US law, Campbell explains, “the federal government has an obligation to consult with Indian tribes on matters that will have an impact on the tribes, their resources, whether it’s water resources or land, their traditional resources, cultural resources, within their traditional areas.” He mentions directives issued by Presidents Clinton and Obama stating that the government needs to take its obligation to tribes very seriously. Holley prods, “Who better to do such an assessment than the ones who live the story between the stones?” To his mind, the Te-Moak should be integrated into the beginning of any cultural surveys. And be paid for it. I ask Chairman Holley if he has faith that BLM would, if properly informed, indeed remove places of tribal concern from the parcels to be leased in June. Tiffany Higgins is a poet, translator and journalist writing on the environment and Brazil. Her writing appears in Granta, Guernica, the San Francisco Chronicle, and elsewhere. In 2020 she will be the Annie Clark Tanner Fellow in Environmental Humanities at the University of Utah.